This card is simple, simple (in other words... EASY)! 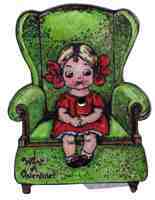 Stamp on card stock, color girl/chair and her eyes on easel pieces only. Cut out the 3 pieces. When you move the easel back, the little girl's eyes move back and forth! (See the eyes on the little easel pieces? Looks kind of scary unassembled! Again you will need a tiny brad to attach. Attach with a brad the B eye piece where you see the black dot and line it up with the button on the dress of the little girl... et voila!